I am extremely appreciative of the housekeeping staff whenever we travel. One of my favorite things about leaving home is that I get a break from all my usual cleaning duties, so the people willing to do it for me are my heroes. We always make sure to leave a tip when we check out, but I never thought to leave it in something cute. 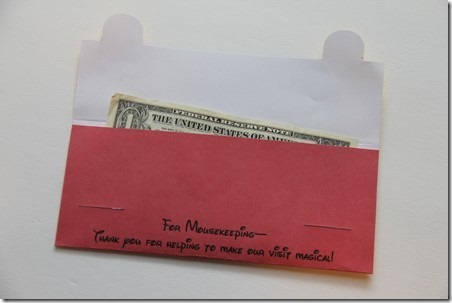 My friend Erika sent me a link to a cute envelope someone had made to leave a tip for the housekeeping staff at Disneyland, otherwise known as Mousekeeping. When we were planning for our recent trip, I decided to come up with one of my own. I thought Mickey’s wizard hat from Fantasia was appropriate. I was able to make this using only simple shapes in MS Publisher. The font is Waltograph and can be found at Dafont. Just click on the image below to download the printable PDF. Print out on white cardstock. Cut out, cutting around the two yellow tabs at the bottom and carefully cutting the two black slits just above the writing. Cut around the top of the ears and hat only above the faint yellow line (do not cut the line). I found the best way to do this was with an Exacto knife. …tuck the tabs into the slots and leave somewhere for Mousekeeping to find. I’m anxiously looking forward to the next time I can make use of one of these envelopes!